It starts from the moment you step off the bus and doesn’t quit, even after arriving at your room: awe. Amazement. 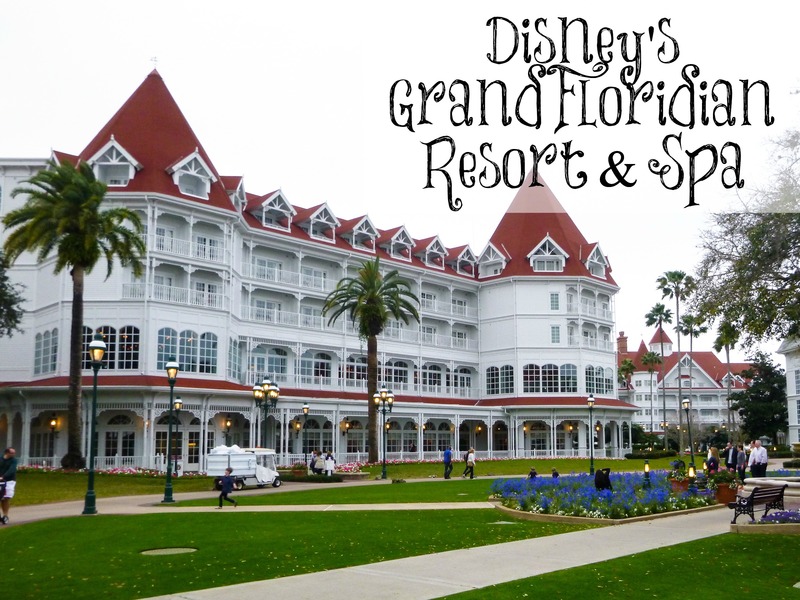 Because at the Grand Floridian Resort and Spa, everything truly is grand. The gigantic lobby with the ceiling that is so many stories high I never really saw it. The piano music being played live. The helpful people just waiting to check you in. The bellman, who was ready to whisk me away with my luggage, even though my building was a short walk away. The immaculate grounds, tended to constantly. The green grass like a golf course, accentuated by the bright flowers in bloom. The white and red Victorian-style buildings. 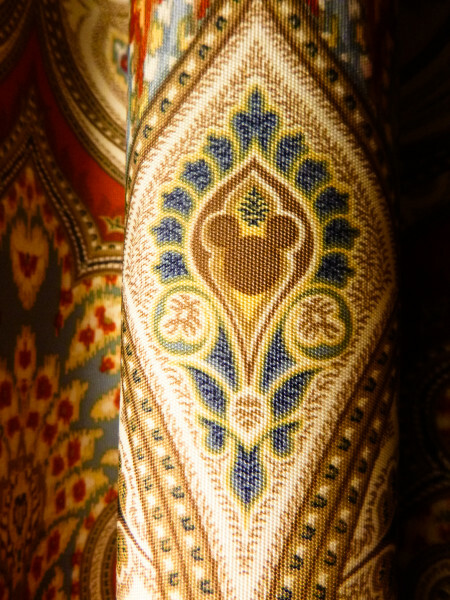 The plushy carpeting in the hallways (such a relief to aching feet at the end of the day!). And the room itself. 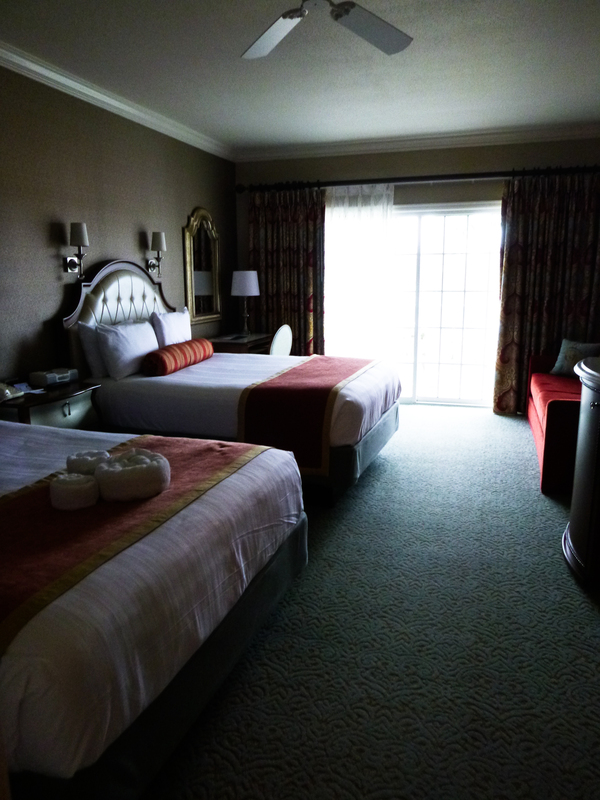 Oh yeah, the room was awe-inspiring. The Grand Floridian Resort & Spa’s lobby is truly a wonder to behold! 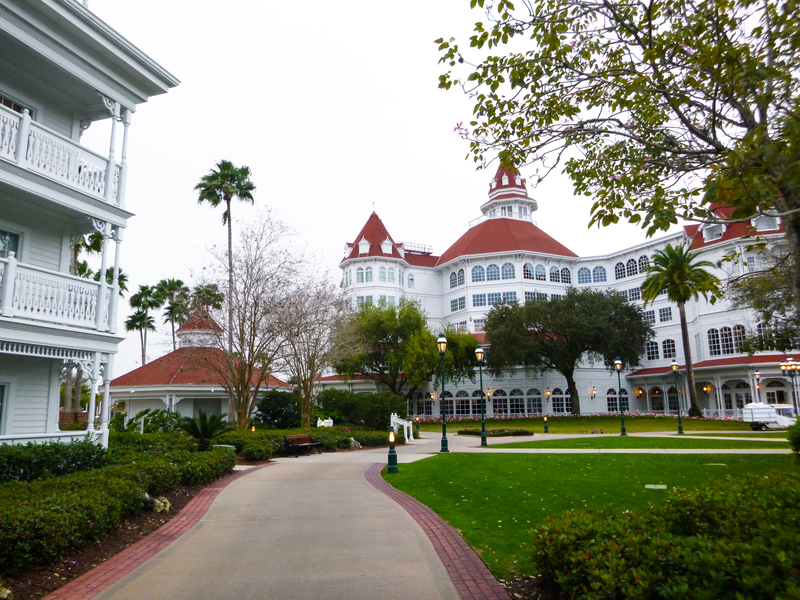 I arrived at the Grand Floridian having transferred from another Disney property hotel, the Caribbean Beach Resort. 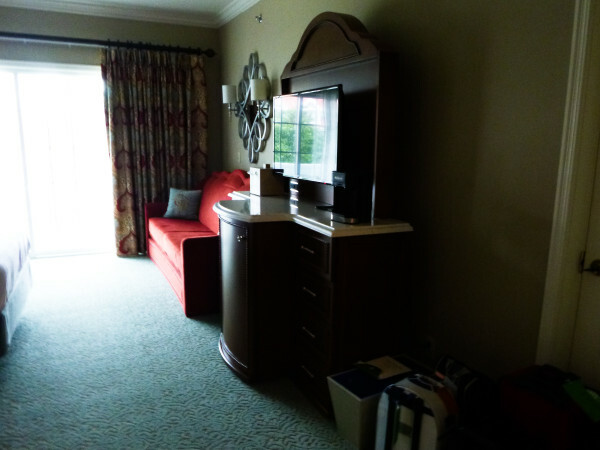 Transferring our luggage was seamless: we called the front desk at Caribbean Beach, they sent a gentleman up right away to tag our luggage and take it, and–voilá!–there it was at Grand Floridian waiting for us when I arrived that afternoon! It was like magic! And was greeted with clean comfort. Beauty in its understated simplicity with touches of opulence. The finest hotel room I’ve ever stayed in. The room was a pleasure to explore. From the beds with extremely comfortable mattresses (I often have difficulty sleeping away from home–I had no difficulties here! ), to the pull down twin bed on the couch that the kids took turns sleeping on, to the hidden refrigerator in the cabinet that housed the television and one-cup coffee maker, it was all so beautiful. 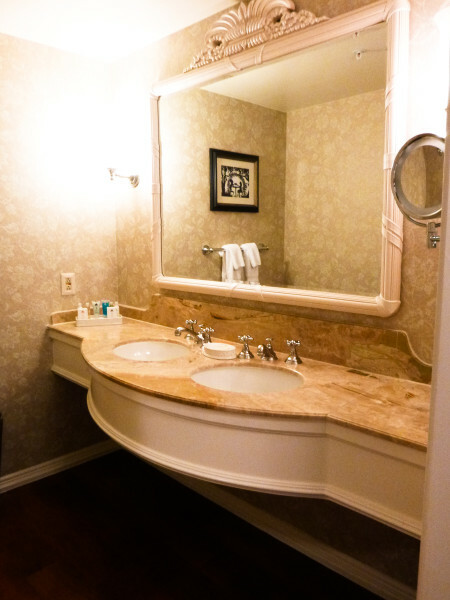 The bathroom consisted of a separate area with double sinks, a lighted make-up mirror, and hamper, so you can prepare for heading out without bothering anyone who is using the facilities or showering. Shades of beige that may normally be mundane were transformed into sophisticated splendor here. Lovely! The room that housed the toilet and shower itself was small, and the door did hit the toilet if you opened it too much. 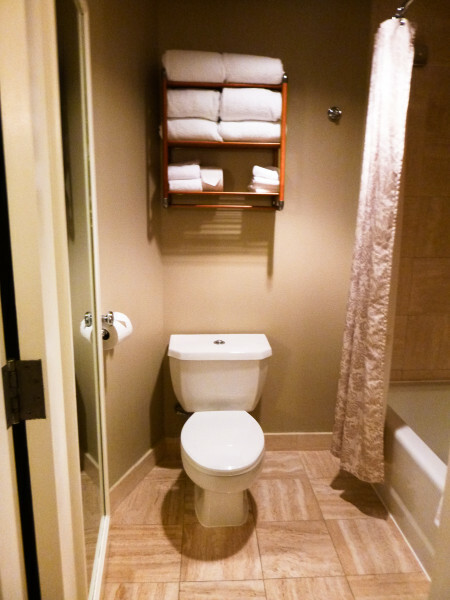 That detail may bother someone who is accustomed to spending more for accommodations. For me? It really didn’t bother me at all. The only thing I found lacking in there was a garbage pail–which could be found near the sinks. As a woman, sometimes you need a garbage where the toilet is. The toiletries!! 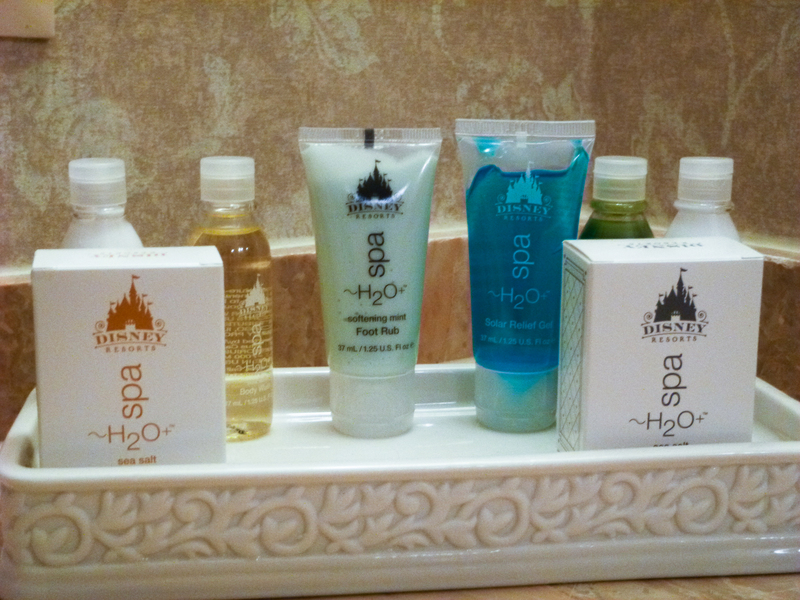 Oh, the toiletries! I don’t think I’ve seen so many bottles lined up in a hotel room before! It was a nice touch that they include after sun care, in case you get a little burnt on your trip. The soap smelled wonderful and my hair really took to the shampoo and conditioner quite nicely. And, of course, the mint foot rub. I adore it! I did discover, back home, that you can order full-size versions of these online, in case you’re feeling nostalgic after your trip. The toiletries! My favorite was the foot rub, which came in handy at the end of long days walking around the parks! Then I investigated the balcony. Yup, you read that right: the balcony. I wasn’t expecting one, so it was a pleasant surprise. But it was quickly overshadowed by what waited for me out on that balcony: a view of Cinderella’s castle. YES! Not only could I see the water from my Garden View, but we could take in the splendor of the symbol of Magic Kingdom right from our bed every night. It’s a small touch, but it made a huge impression on me. 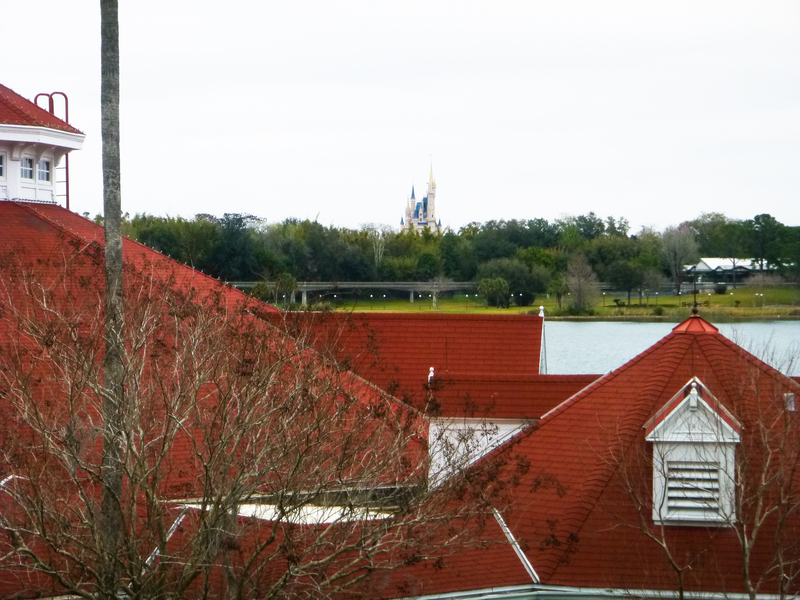 We even had a view of Cinderella’s castle from our balcony! 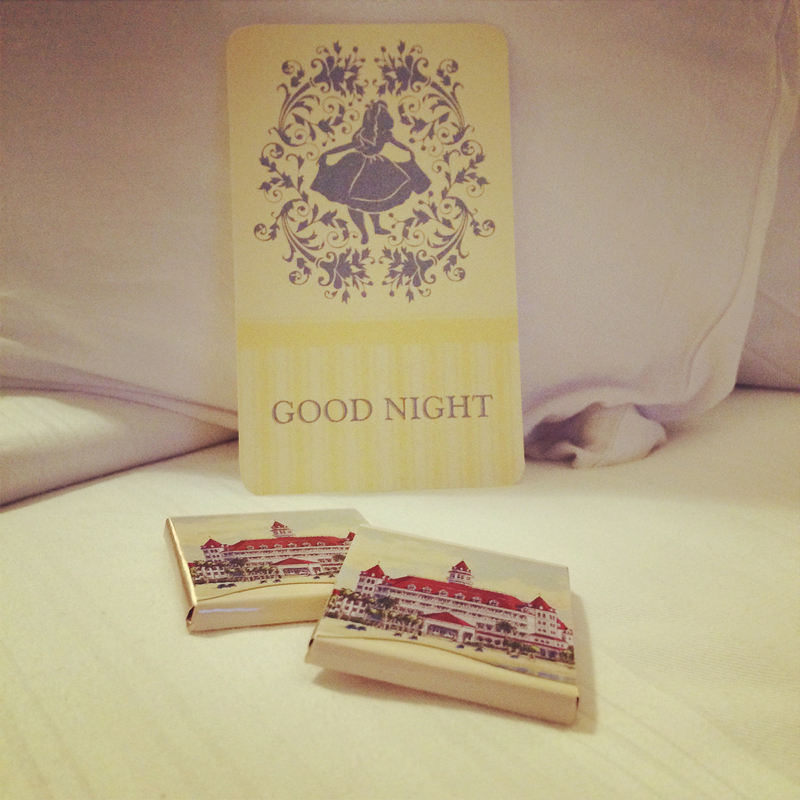 Every night, we were offered turn-down service, where they turn down your sheets (yup, just like it sounds), fluff up your pillows, and leave some delightful Belgian chocolates for each of you. The first time I heard the knock on the door, I was puzzled, but also quite excited by the prospect. I asked that he return while I was out, to preserve the magic. During our stay, the room continued to be a pleasure. There was only one small thing that bothered me–my kids dropped a couple socks between the bed and wall in a space that’s wide enough for a person to walk through. 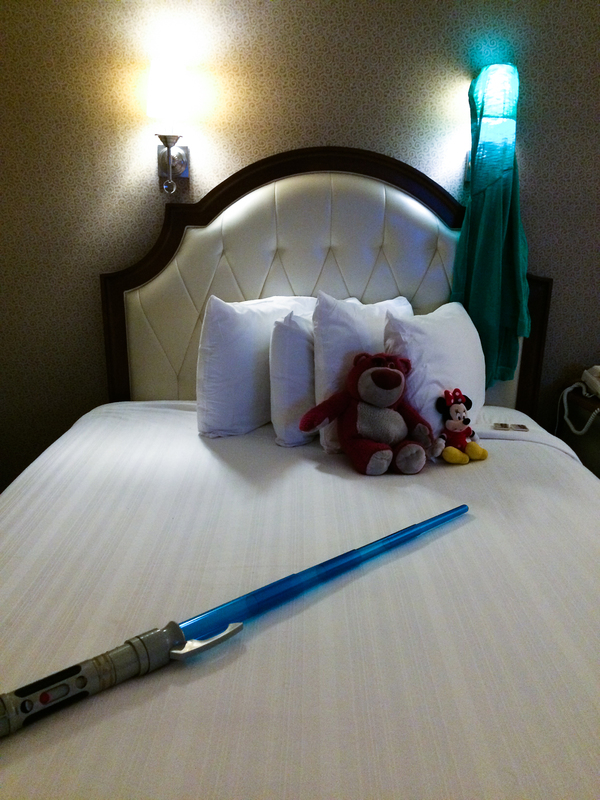 Even though mousekeeping had come to tidy up the room and replenish towels, those socks never moved. I’m not sure they vacuumed during our 3-night stay at all. Also, the first night I dropped the bathrobe in the hamper after using it and it wasn’t replaced during the rest of our stay. Otherwise, it was a stellar experience. Concierge was helpful when we needed to change our transportation to the airport on the day of our departure. There were no issues storing our luggage until we were ready to leave. Valet was quick and efficient in bringing out our luggage for our Magical Express ride back to the Orlando airport, when the time came to leave. Everyone performed their jobs well and appeared to be happy to be there. As for transportation, it’s noteworthy that the Grand Floridian is on the monorail line. The next stop from there is the Magic Kingdom. It also brings you to the Contemporary, the Transportation and Ticket Center (where you transfer to a different monorail line for Epcot), and the Polynesian Resort. You can take a water launch from the Grand Floridian to the Polynesian and Magic Kingdom; returning, the Grand Floridian is the first stop. Buses are available to the other Walt Disney World parks and Downtown Disney. The monorail lines were being worked on while we were there, so there were some small disruptions, but for the most part, it was easy to navigate and fairly painless to use. It was wonderful not needing a rental car! Now I need to return to experience the restaurants and spa themselves! 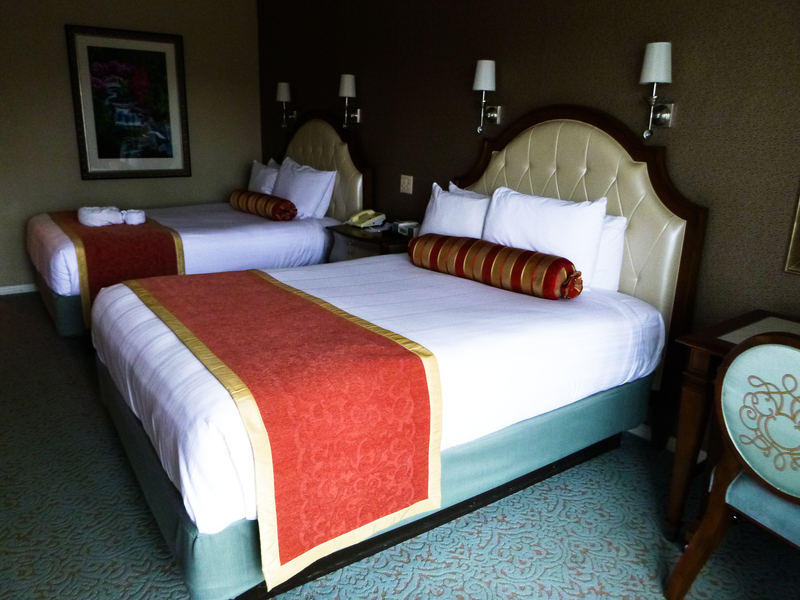 It’s funny that you say it spoiled you for thinking about staying in one of the less-grand Disney hotels. After staying in the Grand Floridian and then the Yacht Club on separate previous trips, we booked a visit with our four kids to stay in a lovely trailer in Disney’s Fort Wilderness. After four nights in the campground, we packed everyone up to stay our remaining three nights in the Yacht Club. We had definitely been spoiled! Jerry’s favorite is the Yacht Club because of the nautical theme, and you can walk to Epcot. 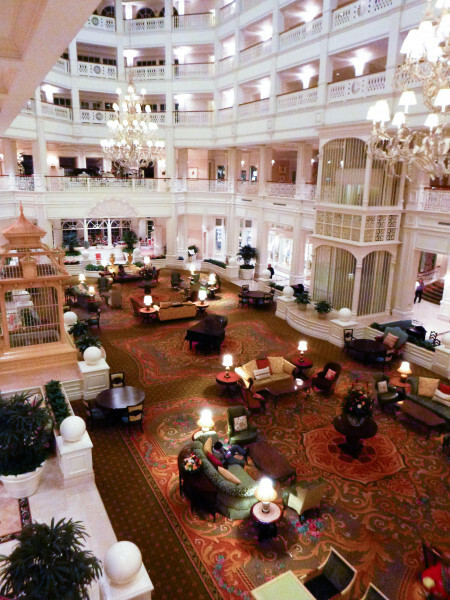 I do love the Grand Floridian though. So glad you enjoyed it! You make me want to go back to Grand Floridian! Thanks for posting about it. This was such a great walk down memory lane, Carrie! My husband and I spent our honeymoon at the Grand Floridian and absolutely loved it! You’re right in that it spoils you! I don’t think I’ll ever stay any where else again when visiting Disney. The convenience and accommodations are unbeatable!